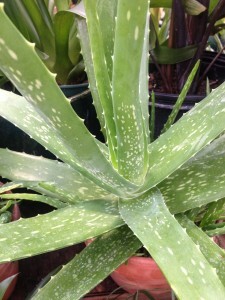 Aloes…There’s More Than Just Vera Out There! The succulent world is full of an amazing and beautiful variety of plants with mysterious names like Echevaria, Hechtia, Aeonium, Senecio, Crassula, Haworthia, and Graptoveria, just to name a few! 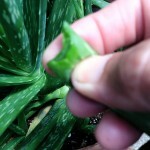 Even the basic Aloe vera plant has been hybridized. It’s definitely no longer the aloe your mom had on the windowsill in the kitchen, there at the ready to soothe burns from the stove or the sun. One of the preeminent hybridizers of aloes is a gentleman by the name of Kelly Griffin, formerly of Rancho Soledad Nursery. As is so often the case in horticulture, folks like him become interested in a particular group of plants, become educated in them, and have the great fortune to be able to pursue their interest, traveling the world and crossing plants to create beautiful hybrids. The link HERE gives you a great picture of the man and his passion for aloes, agaves, and other succulents. The hybrids Mr. Griffin has produced really are very special, and many are a cross between Gasterias and Aloe to create the hybrid Gasteraloe. Pretty nifty, right? They are also commonly called “Table-Top” Aloes. Gasterias have been in cultivation for hundreds of years and can easily be crossed with Aloes, so there are many of these hybrids available. With the interest in all things succulent lately, it’s only natural that these aloes would cross our path, and we’ve added them to the greenhouse collection of succulents as they become available from our suppliers. 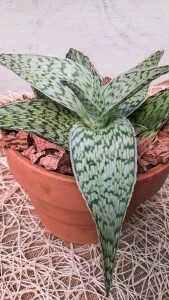 One of the most beautifully patterned is the Aloe ‘Delta Lights‘, released in 2011. The parent plant, Aloe deltoideodonta, comes from southern central Madagascar, an island in the western Indian Ocean. Here in Birmingham, this, and the others mentioned here, will be a houseplant or one that can be summered outside in a container. Morning sun and occasional watering are perfect for this tough plant. Ultimately this beautifully patterned aloe can reach 18 inches tall by about 2 feet wide, with leaves on a healthy plant 3 inches wide at the base and tapering gently at the tips. If you like ‘Delta Lights‘, the next one, ‘Green Sand‘, is even more colorful and unique and considered one of Griffin’s best. More compact, it boasts reddish to maroon tones that become a very deep, rich red the more sun it is provided. 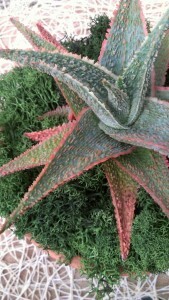 The serrated, bumpy leaves add even more interest to this pretty aloe. The final Gasteraloe is one called ‘Flow‘. It has thick, oblong leaves with white, bumpy protrusions that give it quite a wonderful texture. This fascinating plant is yet another cross, this time using Gasteria verrucosa, a native of South Africa. If only world human populations could get along as well as these plants! 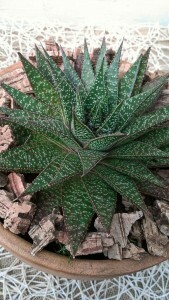 We will continue to carry these and other Table-Top aloes as they are available throughout the year. Any of them would make a wonderful gift for plant lovers in your life or an easy office or houseplant in plenty of bright light and minimal water. This entry was posted in House Plants, Indoor landscape, Indoor Plants, Succulents and tagged aloe, aloe delta lights, aloe flow, aloe green sand, aloe hybrids, aloe sunset, aloe vera, caring for aloes, kelly griffin aloes, succulents on July 28, 2014 by Kris Blevons.